Too much stuff and not enough places to store it compromising the look of your bathroom? Fitting a new bathroom and want to make sure it’s storage packed? 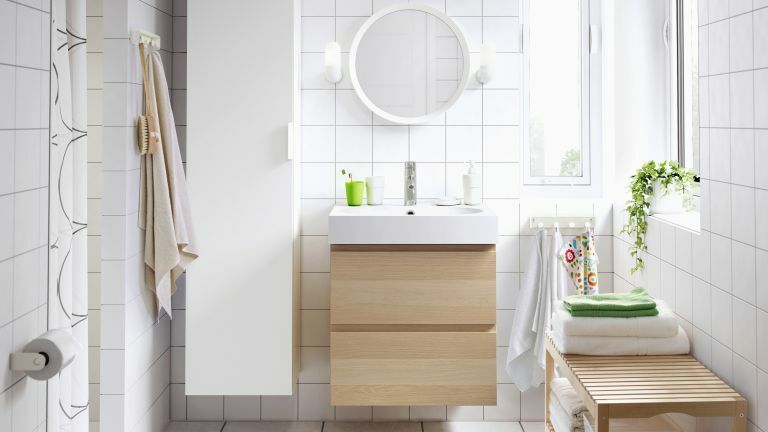 Bathroom furniture’s moved on a long way from the simple cupboard on the wall to now offer storage as efficient as that in your kitchen – and as good looking. Need to get genned up? Our guide to bathroom furniture has got what you’re after. Before you browse for furniture, think about what you need to put away in the bathroom itself. Do you just need a place for toilet rolls and toiletries? Is space for kids’ bath toys required. Is the bathroom cleaning kit kept in the room? Is towel storage what you need? Would jewellery or makeup storage be helpful? Think, too, about whether your bathroom storage needs will increase in the future (perhaps as the family grows), so you don’t have to try to squeeze extra furniture in later. Which type of bathroom furniture? Floorstanding bathroom furniture includes cupboards and shelving units. It’s easily accessible, but needs to be planned carefully to leave the room feeling as spacious as possible and to make circulation easy. Wall-mounted bathroom furniture includes smaller items like cupboards, medicine cabinets and mirrored cabinets, as well as larger wall-hung vanity units with cupboard space or drawers below and a sink above. Wall-mounted furniture has the advantage of leaving the floor underneath on show, which gives the impression of extra space, ideal as small bathroom storage or in a busy family bathroom. Which bathroom furniture to include? Mirrored wall cabinets combine two must-haves in one. And although the cupboard space behind the mirror is often shallow, it can be particularly useful for small items that would get lost in larger cupboards. Vanity units and consoles team two bathroom essentials – in this case, sink and furniture – in one piece and are therefore a useful space-saver. Drawer and cupboard units will pack in the most storage, but elegant table-style consoles can feature slim drawers or open shelves below the basin, as well as creating countertop space. Choose the latter if the piece doesn’t need to work quite so hard storage-wise and you want furniture to make an elegant statement. Toilet and sink units can combine two fittings into one pipework-concealing package that’ll make the room look neat with storage incorporated as well. Fitted or freestanding bathroom furniture? Fitted furniture is a space-efficient way to pack in bathroom storage without leaving the room feeling cramped. It can also create the aesthetic you want whether that’s a more classic look, or sleek and modern. Freestanding bathroom furniture can make a fantastic focal point for a room as well as concealing all the necessary. You’ll be able to change its position in the future if required, and easily add it into a refitted bathroom, or take it with you when you move. Freestanding pieces can be positioned together, but if maximising every centimetre’s the goal, perhaps in a loft or small bathroom, fitted furniture is probably a better option. Bathroom furniture can be contemporary and minimal in its appearance, or have a more classic look. Contemporary bathroom furniture is often white and frequently glossy in finish, which will reflect light to make a small bathroom feel bigger. Like a white suite, furniture in this colour is also a neutral backdrop to which you can add colour with more budget-friendly buys like towels. Doors and drawers often have sleek bar handles or are handle-less. Want a change from white? Look out for modern bathroom furniture in shades of grey or brown neutrals or, for a striking contrast to bath and basin, black. Alternatively, consider contemporary bathroom furniture with a wood-look finish or veneer to add decorative interest and warm contrast to a room that majors in white. Traditional bathroom furniture often has Shaker-style panelled doors, and a painted wood finish in white or off-white, grey or green, while cupboard doors and drawers tend to feature knobs rather than handles. It will complement traditional-style baths, basins and toilets. The outline of traditional furniture may sometimes be more curvaceous, too. What is bathroom furniture made from? Bathroom furniture is designed to cope with the humid atmosphere of the room. It’s frequently made from MDF or MFC (melamine faced chipboard), and can be finished with vinyl, acrylic or laminate, as well as wood veneers at the higher end of the market. Wood is also used for bathroom furniture and is likely to be constructed and finished to be durable in the moist environment of the bathroom. Countertops may be in more luxurious materials such as marble, glass or granite, or seamless solid surfaces. Mirrored cabinets are generally made from stainless steel. Walls may have to be strengthened to support wall-mounted furniture. Speak to a builder for advice. Corner furniture, whether floor-standing or wall mounted, can enable you to create extra storage in a small bathroom. Choose tall units that maximise storage vertically to make something out of ‘dead’ space. Pay attention to how far doors and drawers of bathroom furniture will open to avoid clashes with other furniture or doors. Looking for more bathroom advice?